FBR Founder/President David April and Dr. Manuel |The Professor” Castillo. If you’ve been at a Philly beer bar on any Thursday evening the last nine years, chances are you’ve had a beer with the Fishtown Beer Runners (“FBR”). Founded by David N. April and Eric Fielder almost 10 years ago, FBR gathers weekly to run to a different bar where they each have a beer or two to combine responsible running and consumption in the interest of science and to toast “The Professor!” The club was inspired when April and Fielder read an article about a beer study conducted by Professor Manuel Castillo at the University of Granada (Spain) Medical School. 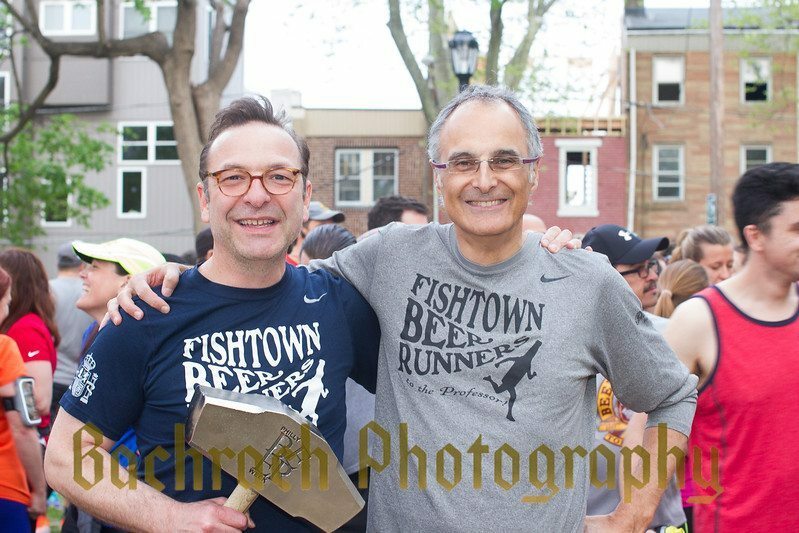 I’ve reported on David April before in ASN and elsewhere; however, just like the Fishtown Beer Runners themselves, David and his club’s story just keeps on growing. The first ever Beer Runner’s Summit took place over four days in Philly a handful of months ago, including a Beer Running Symposium, a cancer-research fundraising event, several beer runs in Center City and points beyond, a big symposium at Thomas Jefferson University, and Dr. Castillo’s first visit to Philadelphia since FBR was founded. FBR president/founder David April – who successfully underwent treatment for his kidney cancer – has participated in 15 marathons and still enjoys a good beer after a long run, especially crisp German lagers and his favorite, a good smoked Rauchbier. Dr. Castillo also favors lagers – when he’s not busy being a professor of Physiology at the University of Granada Medical School, where he specializes in nutrition, sports and anti-aging therapies. Castillo marvels at how large FBR has become, “I did a humble study to answer a simple question: Taking a couple of beers after playing tennis was a good or bad idea?” Obviously, the verdict in Philly is it’s a great idea!